James Buchanan was born in Mercersburg, Pennsylvania, on 23rd April, 1791. Both his parents, James Buchanan and Elizabeth Speer, had emigrated to the United States from Ireland. His father, who had arrived in 1783, worked as a storekeeper. Buchanan attended Dickinson College and after graduating in 1809, studied law in Lancaster, Pennsylvania and later established a successful legal practice in the town. In 1814 Buchanan was elected to the Pennsylvania legislature and as a member of the Democratic Party served in the House of Representatives (1831-33) and the Senate (1834-45). President James Polk appointed Buchanan as his Secretary of State in 1845 and was in office during the Mexican War. He played an active role in the Oregon border dispute with Britain and failed in his attempt to buy Cuba. In 1848 Buchanan was unsuccessful in his bid to be nominated at the Democratic Party's presidential candidate. Buchanan returned to his work as a lawyer before accepting the post as minister to Britain (1853-56). Buchanan made another attempt to become a presidential candidate in 1856. In the past he had condemned slavery as immoral, however, he argued that freeing the slaves would result in "greater evils". This position enabled him to become the Democratic Party candidate and in the election took on John Fremont, an outspoken opponent of slavery. In the election Fremont and the Republican Party attacked Buchanan for his contradictory views on slavery. He was also severely criticized for saying that ten cents a day was acceptable pay for a working man. However, Buchanan (1,838,169) comfortably defeated Fremont (1,335,264) in the election. During his presidency Buchanan supported the attempt to establish Kansas as a slave state. He also failed to take decisive action when South Carolina left the Union. Buchanan argued that the Constitution granted the federal government no power to "coerce a State into submission." He also recommended that the Constitution should be amended to guarantee slavery where it already existed. Financial scandals weakened his administration and he did not stand for re-election in 1860. Abraham Lincoln was elected in the November but did not take office until March, 1861. Lincoln had meetings with Buchanan but failed to persuade him to reinforce federal forts. Buchanan argued he was unwilling to take any decisions that would lead to a civil war. However, his critics argued that his unwillingness to take positive action made war more likely. In April, 1861, Buchanan accused the Confederate States of deliberately causing the American Civil War when their forces attacked Fort Sumter. Throughout the war Buchanan supported the federal government in its attempt to maintain the Union. Buchanan issued a statement that: "Mr. Lincoln had no alternative but to defend the country against dismemberment. I certainly should have done the same thing had they begun the war in my time." Despite Buchanan's public support for Abraham Lincoln, in December, 1862, the Senate debated a censure motion that accused Buchanan of failing "to take necessary and proper measures to prevent" rebellion out of "sympathy with the conspirators". The resolution was defeated and later Buchanan wrote a defence of his actions and published it as Mr. Buchanan's Administration on the Eve of Revolution (1866). 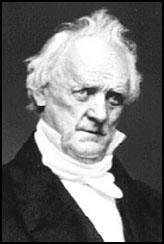 James Buchanan died in Lancaster, Pennsylvania, on 1st June, 1868.